Scarlett, Mainframe, and the rest of Bravo Team are trapped underground and on the run from Cobra, with Joe reinforcements still hours away. Do the good guys always win? The best I can say about this story is that it is over. Dixon clearly had a vision where everyone would end up; he just didn't seem to care how they got there. There are too many plot holes and "WTF" moments that are inexcusable for someone of Dixon's experience. Vipers being ordered to hold fire against the Joes because the blades of the Eartheater will do the job??? Mindbender revealing a secret entrance to the Joes only seconds before being rescued by Vipers??? (Not forgetting the fact that a secret escape actually exists, and instead of leading to the surface, it dumps Scarlett and Mainframe conveniently at the exact spot where the rest of Bravo team is.) Mindbender, upon seeing creatures that are thought to be extinct, makes the incredible (and what I am assuming to be unfortunately correct) assumption that they are there because of the presence of an element that "bends time." There is a brief scene in the book where two kids are playing with military toys. One kid, in justifying why his pilot was able to parachute out in time, explains that his pilot was one of the good guys, and good guys always win. For a brief moment, I thought Dixon might be attempting some ironic foreshowing...that the Joes wouldn't win this and that something would go horribly wrong. Nope, it was straight up, well-telegraphed foreshadowing...the Joes win, with only a few scratches to show for it. I bet Rock & Roll even got his Jeff Beck T-shirt back. G.I. Joe is first and foremost a military franchise. 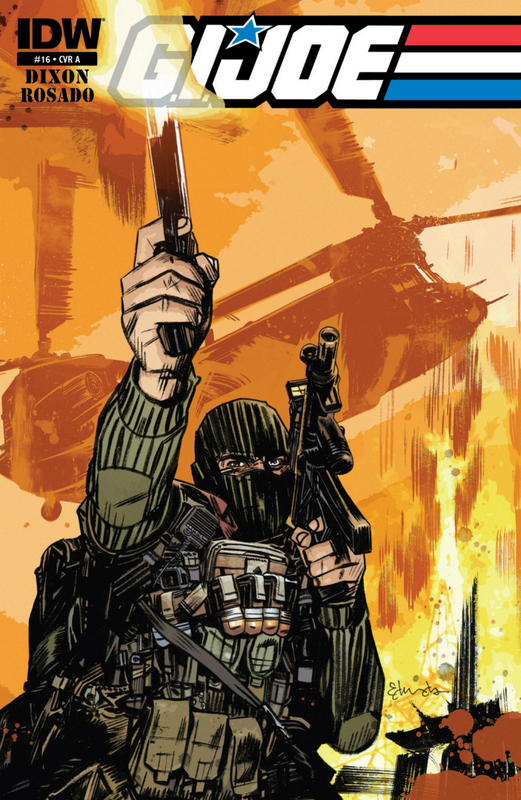 I think I can safely assume with the amount of violence and killing in their books, IDW is aiming their version of G.I. Joe towards a rather adult, sophisticated audience. Dixon's G.I. Joe, especially the "Deep Terror" story, is anything but sophisticated. Besides the undertones of the Scarlett/Mainframe budding romance, there was little in the way of character development this issue. One of the few saving graces of this arc was the fact that Dixon expanded his usual cast of characters and included Stalker, Recondo, Leatherneck, and Rock & Roll. Unfortunately, Dixon doesn't give us much in the way of personality or background on any of these characters (other than the fact that Rock & Roll apparently wears expensive vintage Jeff Beck concert T-shirts to covert reconnaissance missions). At the end of the arc, each of these characters still remain indistinct from each other, and perhaps with the exception of Recondo at the end, none of them had memorable moments that made me feel for that character. I had to look back through my back issues to remind myself who the character is the black hair was (Leatherneck). This was a wasted opportunity for some character development. Once again, Will Rosado's art is the best thing about this issue. I've been enjoying his renditions of the various Vipers, although I admit I'm curious why we don't see anything resembling the version 1 Vipers in IDW. I'm also curious if there's a significance to the red Techno-Viper. An element that bends time? Really? That's where we are going next? A weak conclusion to a forgettable story arc. Pass.